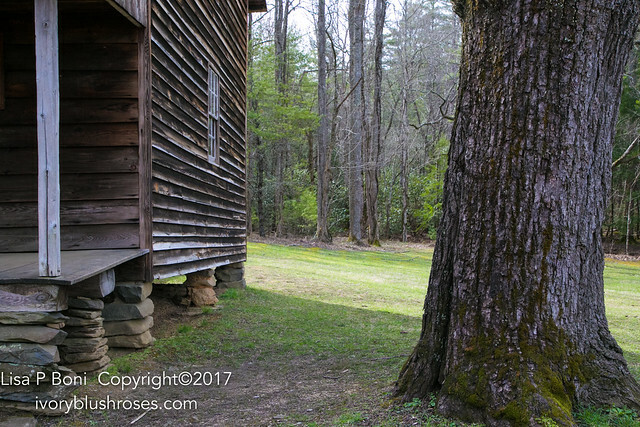 After lunch on the last day of the workshop at the John C Campbell Folk School, I headed off across the Smoky Mountains to Townsend, Tennessee on the recommendation of several people I had met at the school. They felt it was a great place to explore the park from. On the way I passed by this lovely view of Stanteetlah Lake. The snow of the night before had completely melted away leaving everything looking crisp and bright under a beautiful blue sky! I loved the color on the trees and the hint of coming spring. Rather than the green flush I had anticipated, I was surprised at the shades of magenta in the maple samaras (the double winged helicopter seeds) that caused the wooded hillsides to blush. 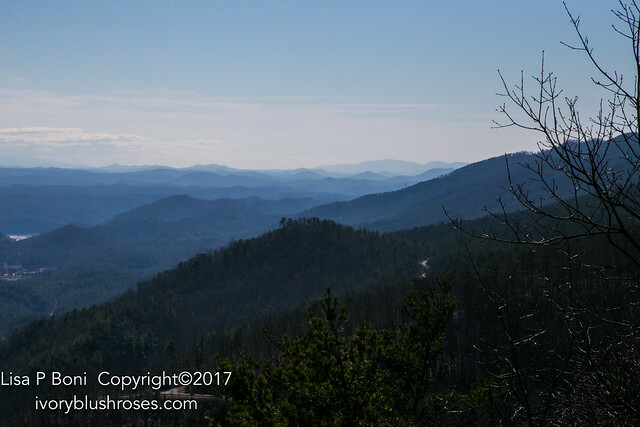 From a high point along the North Carolina/Tennessee border, there was a lovely view of the graduated blue shades of the mountains beyond. The road beyond this point was curvy and one person described it to me a slalom course for cars. They weren't far wrong and I was glad that I was driving as I think being a passenger in a car on that road might have made me bit car-sick! I was so busy driving safely, that I had no opportunity to stop for a photo. I understand that it is a favorite road with motorcyclists as well and I saw many sports cars and motorcycles out enjoying a Sunday afternoon drive on the road. 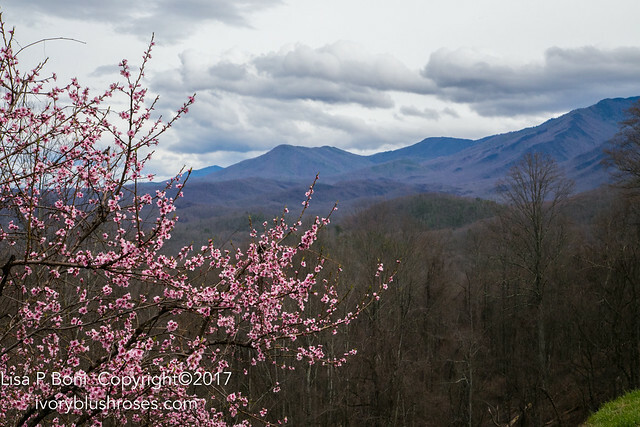 The next morning, I rose early and made my way into Great Smoky Mountain National Park. 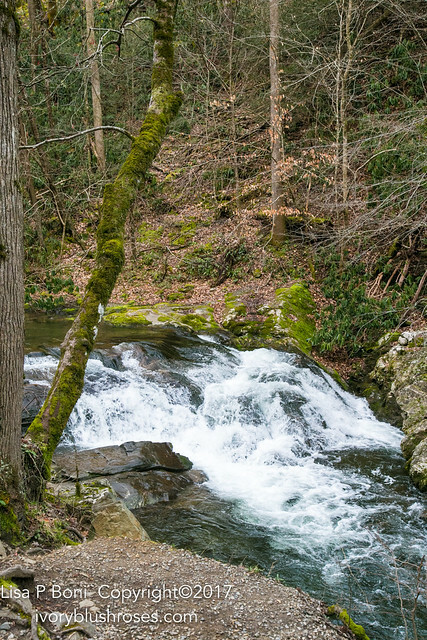 What struck me was the brilliant flush of green along the creeks. Newly born grass along with the yellower shades of dense moss. Just lovely! 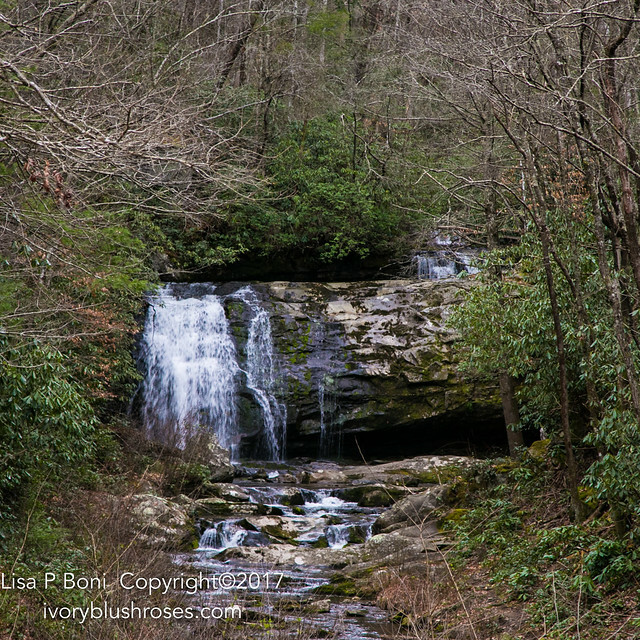 Along the streams, lovely waterfalls of all shapes and sizes. 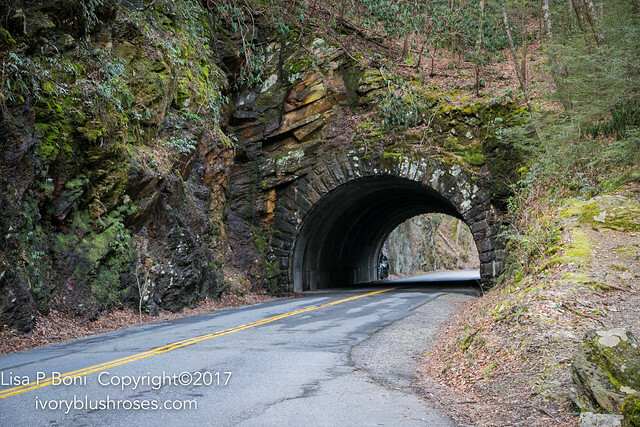 Heading toward Cades Cove, there is a lovely tunnel. The morning damp made the rocks dark and allowed the green of moss and lichen to glow in the morning light. A short walk along the stream showed small beauties that weren't visible when driving along the road. 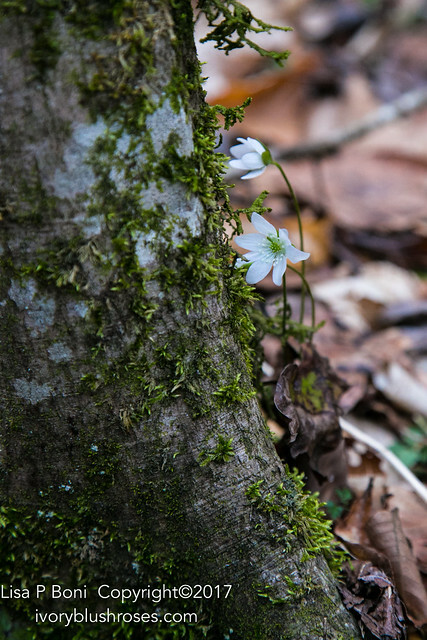 The undergrowth was filled with these tiny white flowers rising on slender stalks above the leafy floor of the woods. So beautiful! 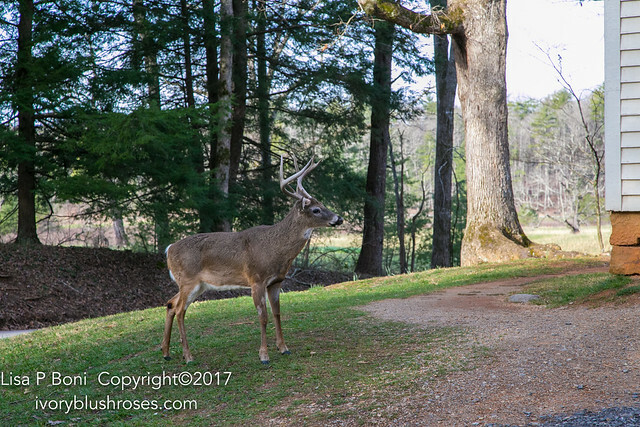 Once into Cades Cove, there was abundant wildlife. 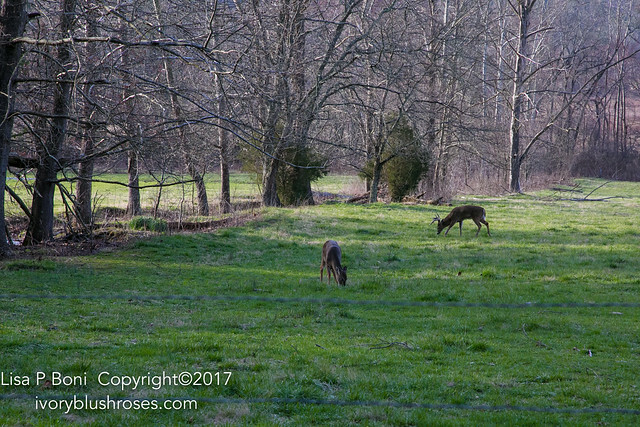 The highlight was a meadow filled with white tailed deer. They were running and jumping and leaping over one another with such exuberance! It wasn't just the yearlings, but the fully grown bucks and does as well! It truly was the highlight of the day! A fairy tale scene, which I had never before had the opportunity to see! 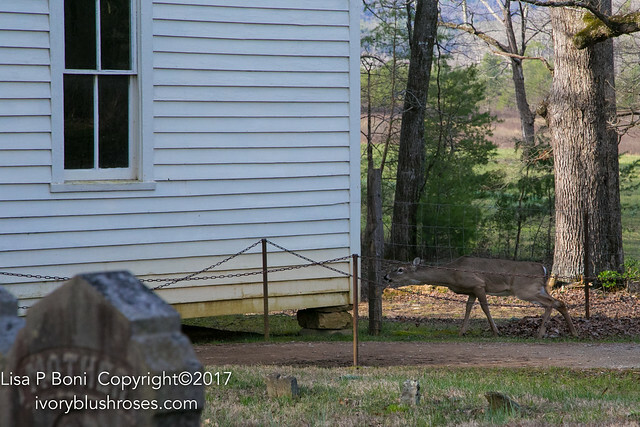 As I went further down the road, stopping to see the various cabins and churches along the way, I was walking up to one church just as this buck walked up towards it from a different side. We stopped and watched one another for the longest time before he decided to turn and go a different direction! As I made my way around the graveyard of the same church, I spied this doe carefully investigating the fence around the church. Soon, she made her way down the hill to the buck. 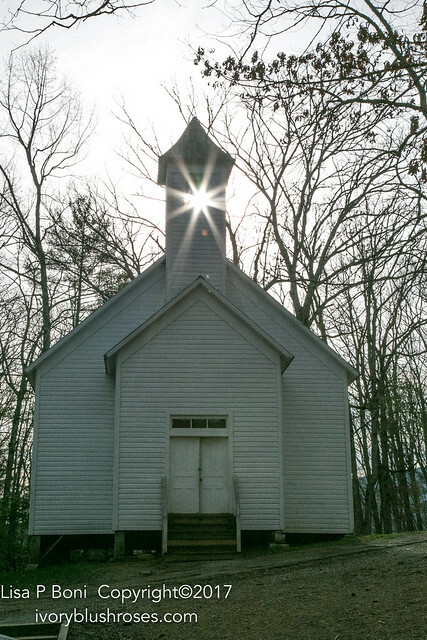 As I walked up to this church, the sun rose perfectly behind the steeple to capture this photo! Isn't it just what a church should be? The place where the light of God descends upon his people so that they may carry it out to the rest of the world! 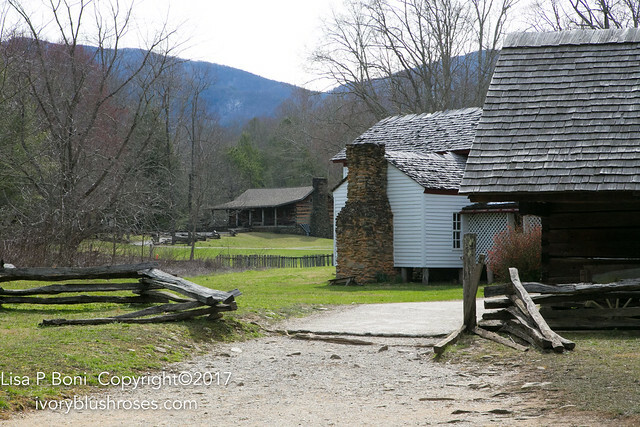 Cades Cove was beautiful with it's broad fields and meadows surrounded by the Appalachian mountains. It's not hard to see why people settled here and also why this area was turned into a National Park. I can't help but feel sorry for the people who were displaced from the park though. How hard it would have been to leave this place. But I am glad that it is now preserved for all to enjoy. 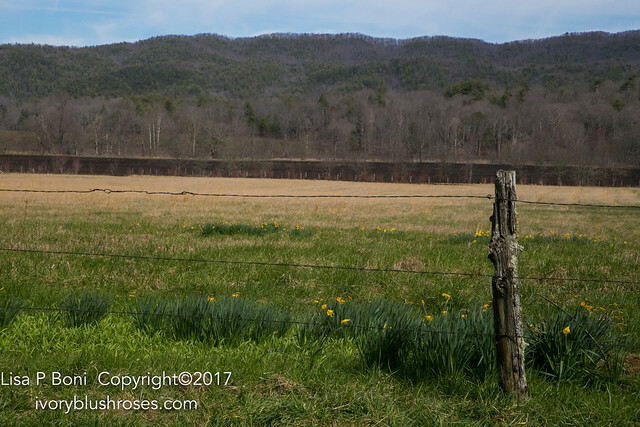 Throughout the park there were clumps of daffodils blooming. At first I wondered if they were native to the area, but upon reflection, I believe they are the naturalized remnants of daffodils planted by the people who lived here in times past. 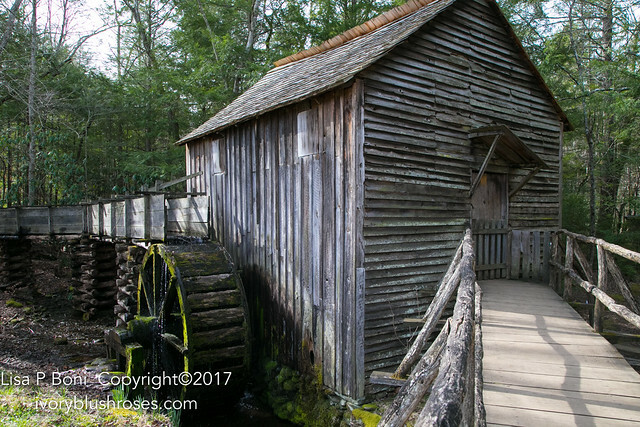 At the Cades Cove visitor center, there are a number of buildings including the Cable Mill. Most of the water in the chute is diverted off, so the water wheel isn't turning. How I would have loved to see it in action! Wandering through the old buildings was delightful. 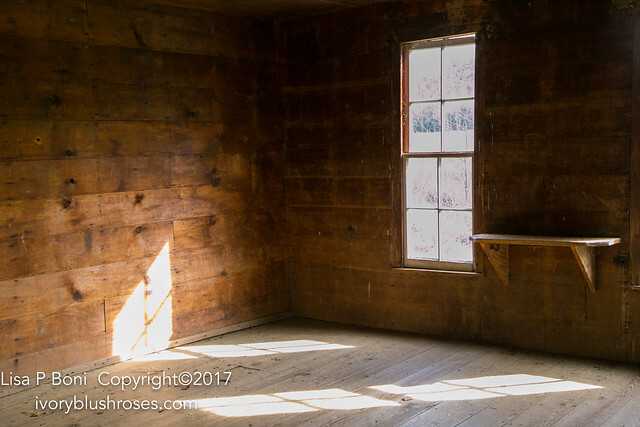 I loved the play of light across the old wood walls and floors. It was a simpler time, not necessarily easier, but perhaps fewer distractions. 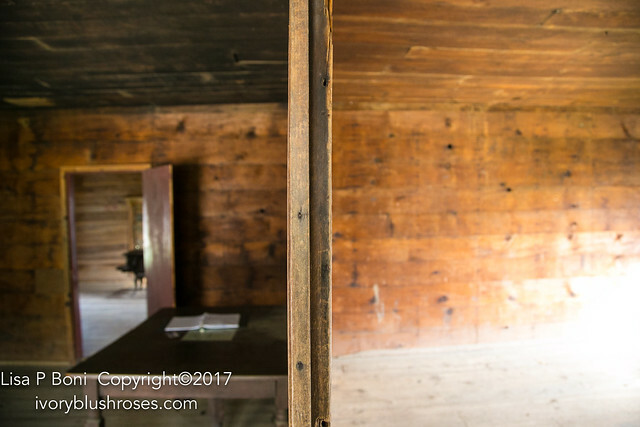 I was fascinated with the construction of the buildings, such as this thin wall separating two rooms. Only the thickness of a board. Yet the rooms are sound and complete. What would it have been like to live here? 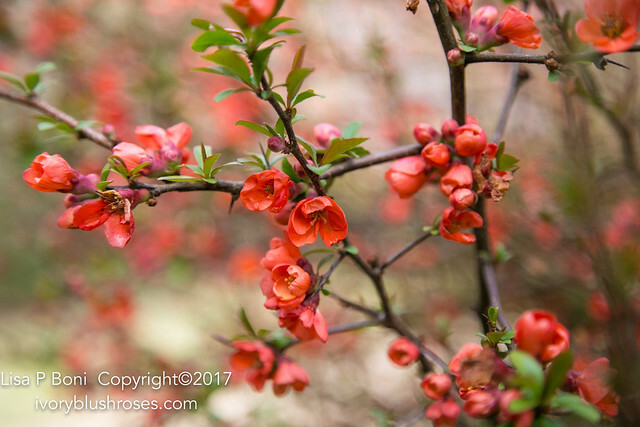 Outside, a flowering quince in bloom. Simply ethereal. Such hope it brings that winter is over, spring is coming, and all will be right with the world. 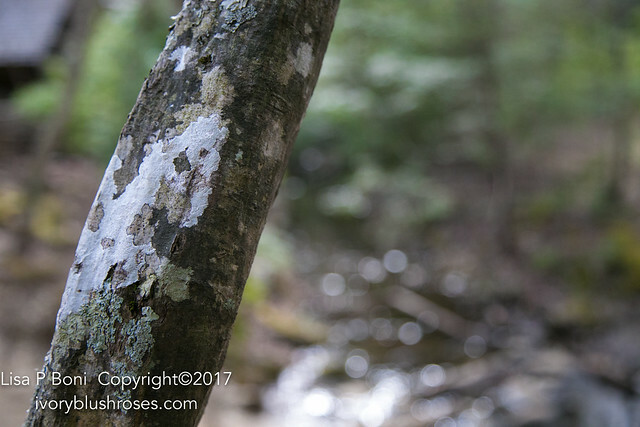 Even the bark of trees was fascinating with layers and differing textures of lichen, moss, and bark. 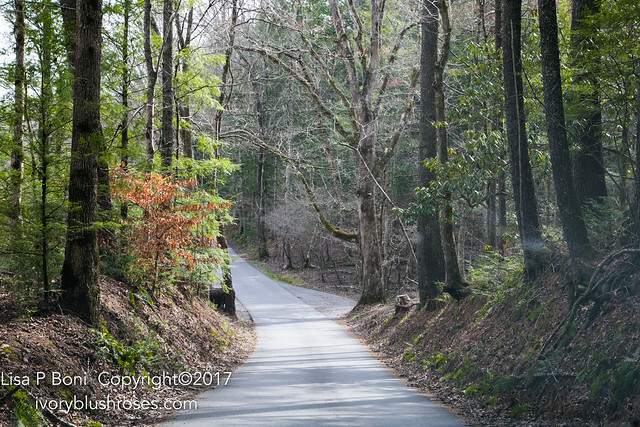 I loved driving the road through the woods. 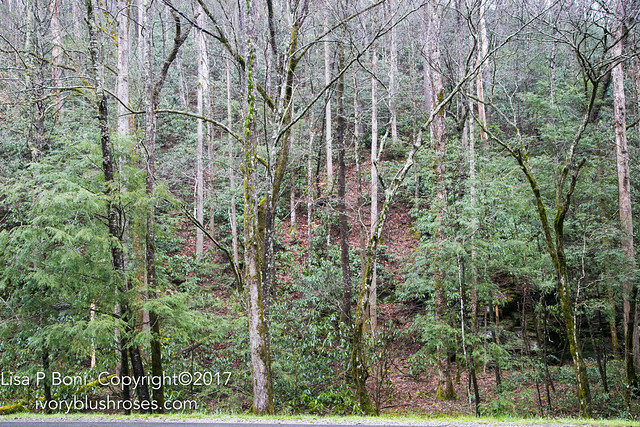 Though the leaves were not out on most of the trees, the woods were green with the Eastern Hemlock trees, which I fell in love with! There was also the deep blue green of the rhododendron shrubs. 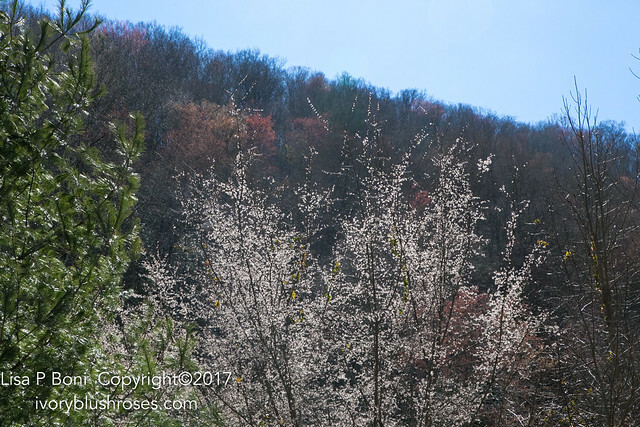 Here and there, the old dry leaves of the dogwood trees caught the light and at first glance appeared to be blooming with a peachy colored blossom. But it was just the old leaves putting on one last show before they drop. Soon the flowers will come and the woods will be filled with an understory of bloom. How I wish I could be there to see it happen! 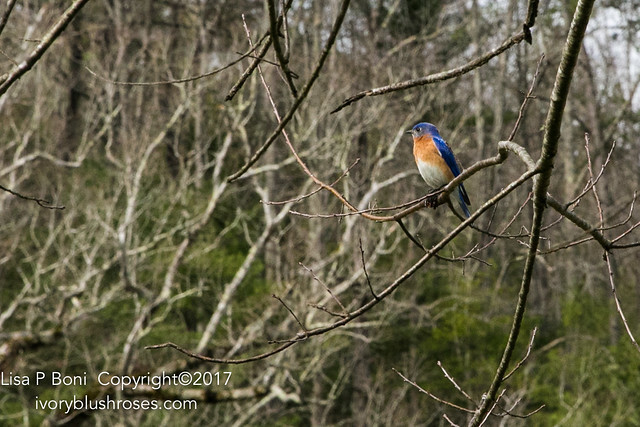 The woods and meadows were filled with birds, many of which turned out to be Eastern Bluebirds! What a treat to see them! 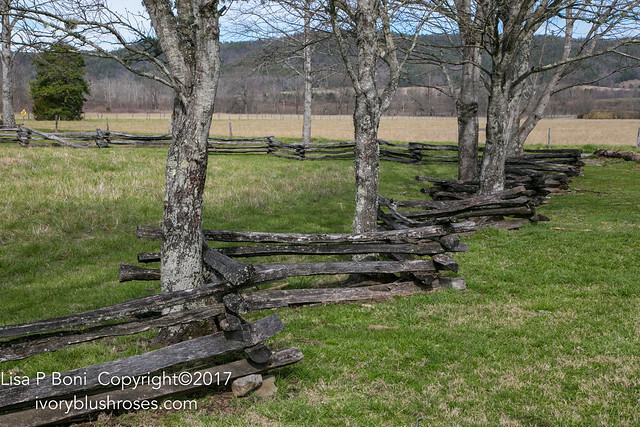 I loved the old stacked fences that curved around the trees. 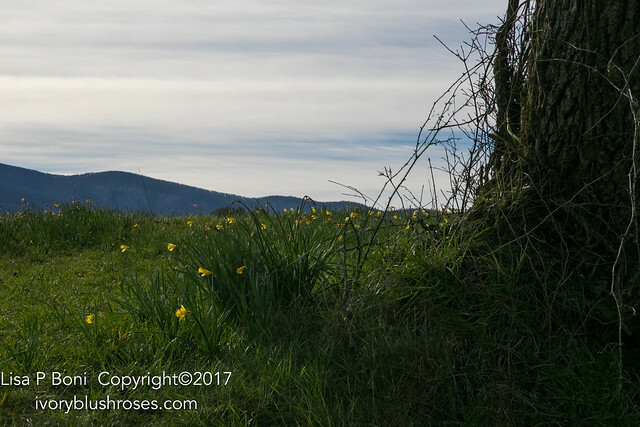 More daffodils in the fields. And that strip of newly plowed soil beyond, ready for planting (if not already planted). Fields like that make my heart sing! Most of the barns here have a large overhang and many have a dog trot in the center. 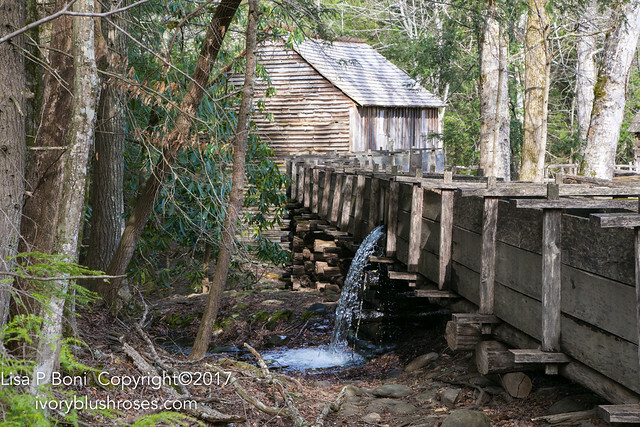 Where barns in the west are built straight and tight, these have lots of space for air to move and overhangs to protect from the rain. It's amazing how these stacks of stones can provide a firm foundation for a large home. Even after a hundred years or more, the floors remain level with no shifting or cracking. 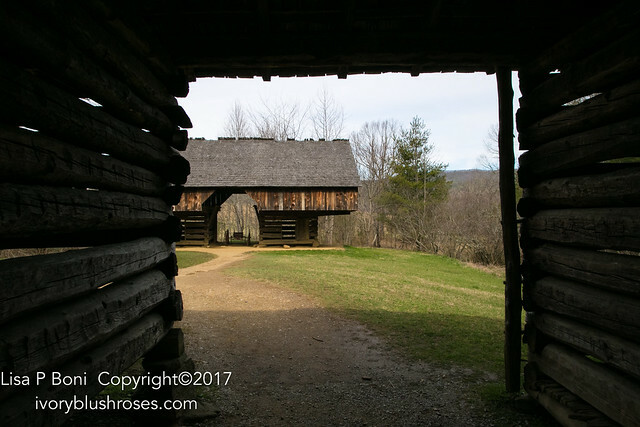 Plenty of log cabins, many made of chestnut. Incredibly beautiful. 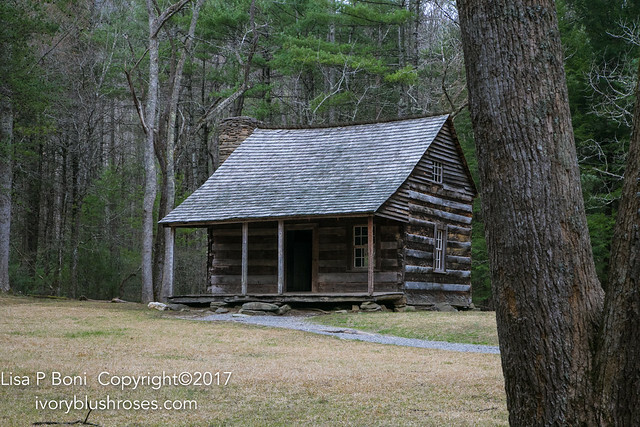 It angered me to see the graffiti penned and carved into these cabins. Much of it with permanent markers, full names and dates. I sincerely hope that the perpetrators were found, charged and prosecuted. Such disrespect. It's something seen too frequently all over the USA, but something I rarely saw when I traveled in Great Britain a few years ago. I've long had a fascination with vernacular architecture, the architecture of the people. 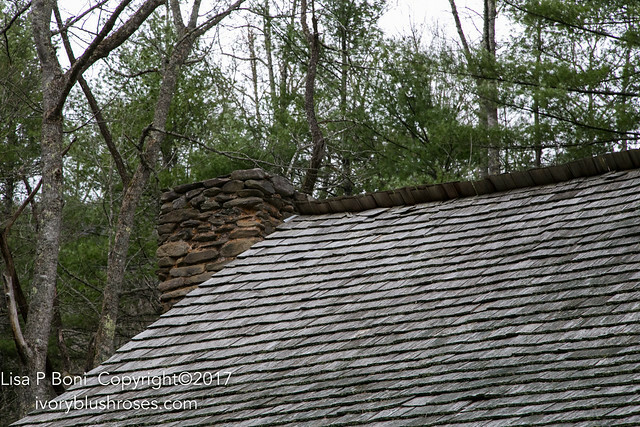 In this area, the roofs all have a Ridgeline of shingles sticking out above the crest. It's something I had not seen on old buildings here in the west. I find the differences intriguing! 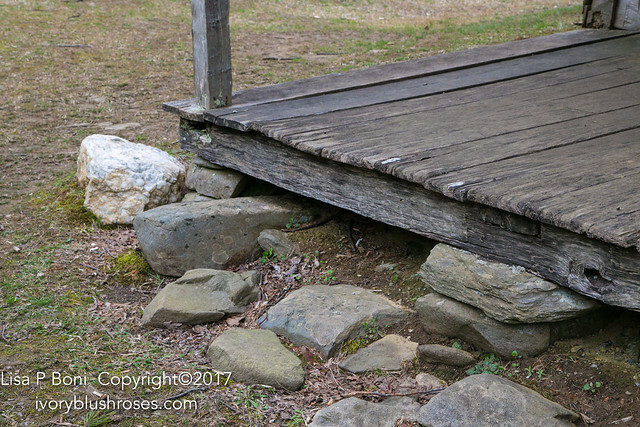 More stacks of stone supporting a porch and the old, old, beams supporting it. 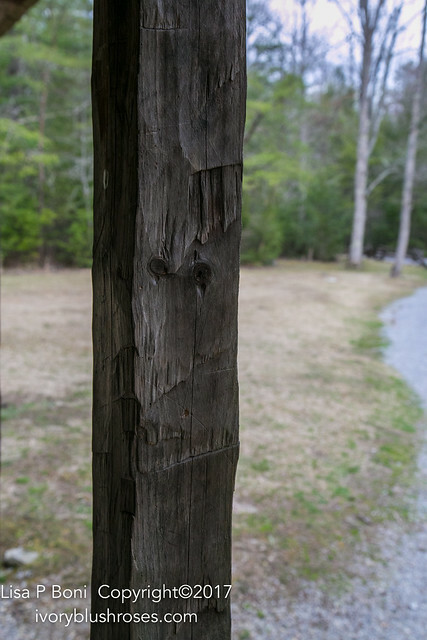 In the porch posts, the hand hewn marks remain clearly visible. No mass produced posts here, but posts cut by a man creating a home for his family with only hand tools and wood that was grown on the land. What a legacy. How many of us today will be able to leave such a mark behind us for future generations? 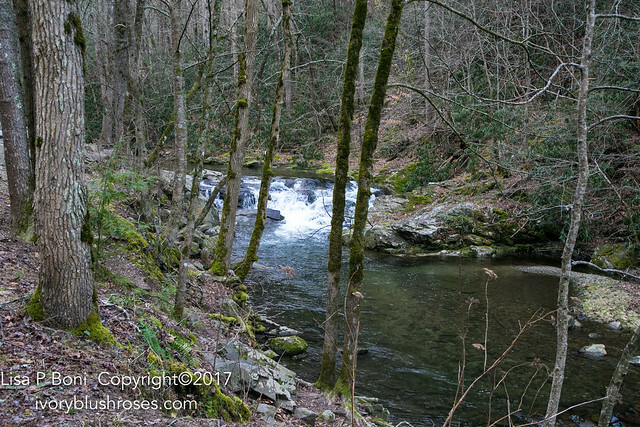 Eventually, I made my way out of Cade's Cove and through other parts of the park. 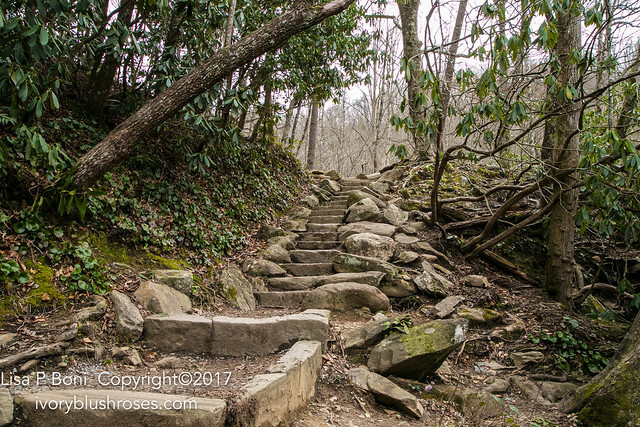 These steps leading to a trail up into the woods caught my attention and made me think of Tolkien's hidden stairs in Lord of the Rings. I truly didn't see them until I was right upon them! At a highpoint on the road to the Sugarland's Visitor Center, I stopped to take in the view, but then my attention was drawn to this lone tree, blooming it's heart out! 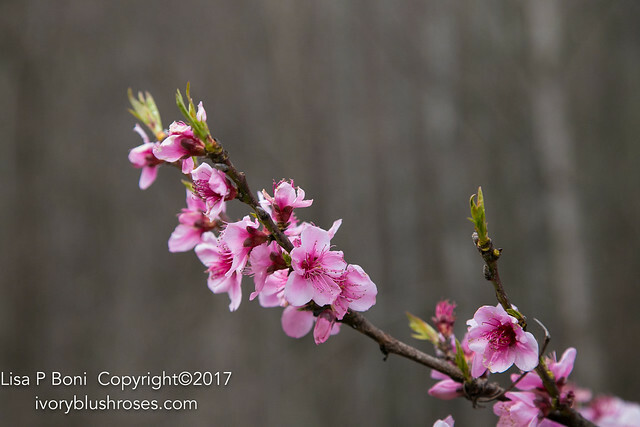 Such beautiful pink blossoms against a drab background of still wintry trees beyond. It made for a lovely view! After a visit to the visitor center, I made my way back to the hotel for the night. Along the way I discovered yet another waterfall that I had missed before! So lovely! Once the spring rains come and the snow from higher elevations melt, I imagine it will be quite a glorious sight! Such a lovely day exploring! I love these woods, even now when they are still held in the last grasp of winter. How I would love to be able to stay and explore them throughout the seasons! Wow, it is all beautiful & peaceful. Exquisite photos, Lisa. Thank you so much for sharing your beautiful journey. 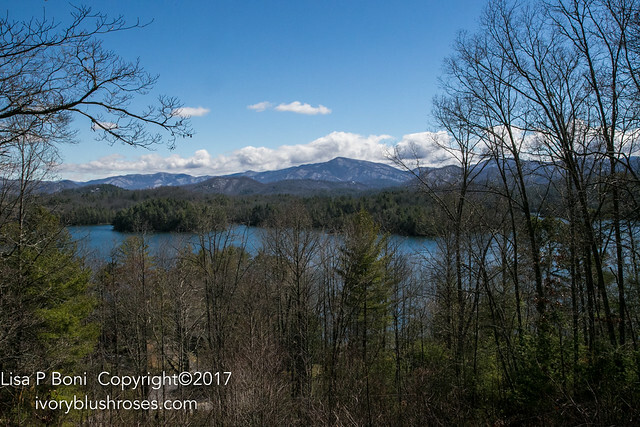 A Trip to North Carolina!